Higher Ground knows how to get a party started. Great dance music from the 60’s to today! 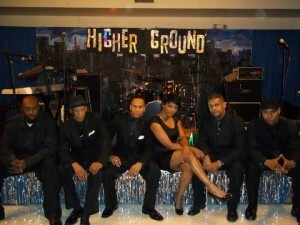 Higher Ground is an incredible hard-hitting band that plays music from the 70’s to today with styles ranging from modern, hip hop, dance, R&B and oldies. Anyone who has seen Higher Ground will be back for more as their energy is unparalleled to any band on the college circuit today. Higher Ground band loves to perform to any audience at any age…….and it shows!